Lincoln Sunrise Rotary Club is helping build a community with some young students’ by bridging a continent with the help of, David Chen, one of their members. David travels to China twice a year for business. When on these trips he likes to travel to small the villages to experience local lifestyle and to better understand the people. There is one thing that troubles him the most and that is the difference in wealth between the city, and the village. The cities has everything, but the villages are still very poor in many things. In our news reports we hear that China is becoming the manufacturer of the world, and a rich nation, which is quite true, but the distribution of wealth is quite uneven. On one of his trips he noticed that many village schools are run down with inadequate facilities and supplies, especially books for the library. They have very limited number of books in their libraries. At one of the Sunrise Rotary club Meetings, David, proposed that Lincoln Sunrise Rotary make a donation to one of the village schools. The members of Lincoln Sunrise voted and it was a “YES”, so they started to work on it. David worked on finding a teacher from Xian to help investigate the local schools, to help us find a school that was in need of books for their library. The teacher suggested the Wang Mang Elementary School. Lincoln Sunrise Rotary Club made a $250 donation toward a matching donation from David Chen. 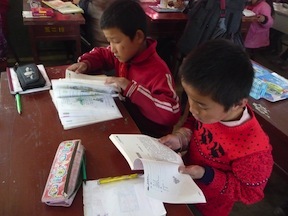 On November 5, 2010, Lincoln Sunrise Rotary Club had donated US$500 worth of books to the Wang Mang Elementary School in Xian. You have chosen a school that is thousands of miles away from Lincoln, Nebraska to give us the books and opened our eyes to the world. Your kindness is greatly appreciated by the entire staffs and students. We want to thank you. When we received your books, the students were celebrating this occasion like a festive holiday. We believe a good book will change a person’s life. So the books are very important to them. The books will open their window to the outside world. The students have spread your kind deed to other villages and towns. There is a Chinese saying that when we receive a drop of kindness, we should repay by the barrel. We have no words to express our gratitude. We can only repay your kindness by becoming a good citizen. Our student will study hard and become productive to the society. This will be our way to pay back your kindness. Words cannot express our gratitude. Your kindness and generosity has provided the student the encouragement to become a good citizen and to develop kindness to others. I hope we will continue our good friendship. Hand in hand we will devote our time and energy to educating the next generation.